In association with MBE's review of the Target Wedding registry, I'd like to thank this family-friendly big box retailer for making a great giftcard giveaway possible on this blog. MommyBlogExpert's $25 Target giftcard giveaway ends September 5, 2014 at 12 am PT and is open to legal residents of the U.S. only. 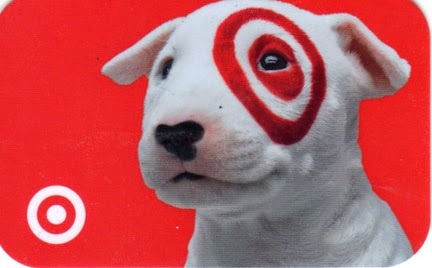 Target will award ONE (1) $25 Target giftcard to the winner. Winner of this MBE contest will be selected at random from all entries and will be notified via email and must respond within 6 hours to claim their prize. FTC Disclosure: This is a #TargetWedding #Sponsored post. I disclose that I will receive compensation in exchange for my time and effort on this giveaway and the associated review post. Target is providing the giftcard and shipping for the winner's prize. However opinions here are my own. See complete FTC Disclosure information that appears at the bottom of MommyBlogExpert's main page and at the bottom of every individual post on this blog, including this one. I like shopping at Target because the variety of products are great and it's a nice, clean environment. I like shopping at Target because they have great sales and discounts all the time, and they built a new big supercenter by where I live and it is easier for me to shop their! I like shopping at Target because the aisles are wide and the cashiers are friendly. Target has great services and I haven't usedit yet! I LOVE shopping at Target bc I can get everything I need in one place! I enjoy shopping at Target. It's a place where I can get all my needs met in one stop. I like that Target has quality products. I especially like their clothing. I like Target's style. I've shopped at Target for years and they are still up to date with their styles. And the sales are great. i like shopping at Target because they have quality products. I like shopping at Target because it is clean and bright and they have quality products. I have not tried their registry yet. I like to shopping at Target for the great sale and price. I love to shop the clearance sales at Target!! I can always get lots for my money shopping that way! I love the great deals and sales. I also love that they have original products. and great products as well! I love shopping at Target because of the variety, prices, and good service. Love it. I like shopping at Target because it's close to my house and they have great sales. I like Target because the store is clean, and has modern and fashionable merchandise at a great price. I love shopping at Target, because they always have everything I need! I love shopping at Target because of the cleanliness of the store and the friendly employees. I love the prices at target and the selection. I like shopping at Target because they have groceries too now - one stop shopping. I like shopping at Target because the variety of products and it's just down the street from me. I like shopping at Target because of the variety and the quality of the goods. I like shopping at target because you can get everything you need in one spot and it is a little more upscale then other stores. I like their children's clothes. I think they have cute stuff that my girls don't mind wearing. Thank you! I like shopping at Target because they have nice styles for both their clothing and home good section and decent prices. I like to shop at Target because it is close to home, the store is clean, and I can get pretty much everything that I need there. I like shopping at Target because they have good sales and are conveniently located for me. I shop at Target as they have some very unique items as well as clothing that my granddaughter's like. I like Target because I can get a lot of my household items at a decent price. I love shopping at Target because of the good deals and coupons! Love the Cartwheel App! I like shopping at Target because it isn't over cluttered, it's bright and the prices are good. I like shopping at Target because they have everything and we like the quality and style of clothes. It was great using the baby registry, that way you get more of what you need at your baby shower. Oh I love shopping at Target for the wide variety they have! I can almost always run to Target and get everything I need ...including gifts! I like shopping at target because they carry good quality items in every department I would need something in. I like shopping at Target because they always have my sons diapers in stock and we can pick up just about everything there! Target always seems to have items and styles that I can't seem to find at other mass retail stores. I love the choices of clothing, shoes and housewares that they offer. I love shopping at target because of their great deals and they always have something I am looking for at a great price! i love shopping at target when i can find good sales or deals in clearence! The registry is fun to make. But most of the time I have to shop for a registry they never have what is on the list in stock! I love shopping there. I haven't used their registry yet though. I love Target because they have pretty stylish and modern clothes and home decor for very reasonable prices, and there are always hidden gems to be found on the clearance racks of both sections! Target is a wonderful place to get nice home design products at great prices. It is also fun to shop their dollar section for novelty items. I like the great prices and sales at Target and the quality of the items I have purchased. I like shopping at Target because they rarely disappoint! We are in the midst of decorating our new house and our stops at Target have sure been successful! I like shopping at Target because they have everything I am looking for. I like the sales Target has. I love Target because you can complete all of your shopping with just one trip! You can get your groceries, birthday gifts for your family members, prescriptions, and clothes all in one store! I like shopping at Target as they have such a great selection of everything at such good prices. I just like finding great bargains for my home! I love shopping at Target because they have the coolest home décor stuff and their seasonal section is always twice as big as any other store! 1. I love shopping at Target because it's a nice, serene environment, people do behave better there than at Walmart :/ . I was at the checkout one time and I heard a girl mention how shopping at Target was like living in the movie Pleasantville haha. Target registry is very easy to set up and maintain. I like shopping at Target because I can get everything at one location from groceries to clothing and household goods to filling a prescription. I like shopping at Target because the store is five minutes from my house, the prices are decent, and I can usually find what I am looking for.